Extracorporeal membrane oxygenation (ECMO) is an increasingly accepted means of supporting those with severe acute respiratory distress syndrome (ARDS). Given the high mortality associated with ARDS, numerous animal models have been developed to support translational research. Where ARDS is combined with ECMO, models are less well characterized. Therefore, we conducted a systematic literature review of animal models combining features of experimental ARDS with ECMO to better understand this situation. MEDLINE and Embase were searched between January 1996 and December 2018. Inclusion criteria: animal models combining features of experimental ARDS with ECMO. Exclusion criteria: clinical studies, abstracts, studies in which the model of ARDS and ECMO has been reported previously, and studies not employing veno-venous, veno-arterial, or central ECMO. Data were extracted to fully characterize models. Variables related to four key features: (1) study design, (2) animals and their peri-experimental care, (3) models of ARDS and mechanical ventilation, and (4) ECMO and its intra-experimental management. Seventeen models of ARDS and ECMO were identified. Twelve were published after 2009. All were performed in large animals, the majority (n = 10) in pigs. The median number of animals included in each study was 17 (12–24), with a median study duration of 8 h (5–24). Oleic acid infusion was the commonest means of inducing ARDS. Most models employed peripheral veno-venous ECMO (n = 12). The reporting of supportive measures and the practice of mechanical ventilation were highly variable. Descriptions of ECMO equipment and its management were more complete. A limited number of models combine the features of experimental ARDS with ECMO. Among those that do, there is significant heterogeneity in both design and reporting. There is a need to standardize the reporting of pre-clinical studies in this area and to develop best practice in their design. In recent years, the use of extracorporeal membrane oxygenation in patients with acute respiratory distress syndrome (ARDS) has grown substantially . ECMO is now an accepted technique for temporarily supporting those with severe ARDS whose condition is refractory to conventional management [2, 3]. Despite advances in our understanding of the pathophysiology of ARDS, mortality among patients remains high, with only a modest improvement over the last decade . A contributing factor may be the failure to successfully translate a proven therapeutic strategy for the treatment of ARDS . Substantial effort has been devoted to this endeavor, and correspondingly numerous animal models of ARDS have been developed to assist in the investigation and translation of novel interventions . As the use of ECMO in ARDS matures, it will become increasingly important to evaluate candidate ARDS therapies in the unique context of extracorporeal circulation . Likewise, interventions primarily associated with ECMO require established pre-clinical models to facilitate progress toward clinical trials. There are fewer well-characterized models which combine experimental ARDS with ECMO than ARDS alone. To better understand existing animal models of ARDS and ECMO, we have undertaken a systematic review of studies reporting novel models in animals. A systematic appreciation of animal models which include the use of ECMO will allow us to identify current limitations, establish areas for innovation and improvement, and will assist in the creation of a minimum data set for pre-clinical ECMO studies. 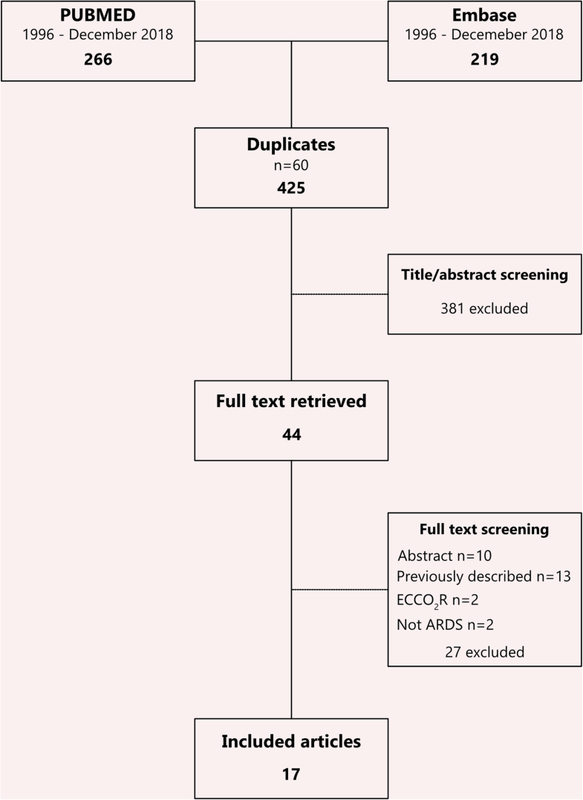 A systematic review protocol was constructed in advance and published on the Systematic Review Centre for Laboratory Animal Experimentation (SYRCLE) website (https://issuu.com/radboudumc/docs/animal_models_of_acute_respiratory_?e=28355229/48256411). The protocol addresses the requirements of the Preferred Reporting Items for Systematic Review and Meta-analysis Protocols (PRISMA-P) statement . The published protocol was amended after publication to remove the requirement for papers to be published in English. A native language speaker was identified to translate those not appearing in English. We searched the MEDLINE (via PubMed) and Embase (via Ovid SP) indexed online databases from January 1996 to December 2018. The search strategy was designed in conjunction with a trained medical librarian (see Additional file 1 for the full search strategy). The filters used to identify animal studies were those previously described and validated by de Vries et al. and Hooijmans et al. . Citations were collected in a reference management software program (EndNote™, Clarivate Analytics, PA, USA). Study selection occurred in two phases. Firstly, abstracts and citations were independently screened for relevance by two authors (JM and NB). Discrepancies were resolved by reference to a third author (MM). Articles were excluded on the following basis: (1) if they were not performed in animals, (2) if they did not involve the use of ECMO, or (3) if they did not include a model of ARDS. The full text of articles deemed relevant was retrieved. There were no language restrictions. Articles not published in English were translated by a native speaker. In the second phase, full-text articles were independently reviewed (JM, NB) and excluded if (1) they did not report an animal model, (2) they did not use veno-venous, veno-arterial, or central ECMO, (3) they did not include a model of ARDS, (4) they were in abstract format, or (5) if the same model of ARDS and ECMO had been reported in a previous publication. Disagreements were resolved by a third author (MM). The reference lists of screened studies were reviewed to identify publications not found by the original search strategy. Study design. The aim(s) and hypothesis of the study was recorded, as were elements related to study design, such as randomization procedures, blinding, the use of sub-groups, and sample size. Animals and their peri-experimental care. This included information on the species, strain, age, weight, and gender of the animals used in experiments. Additional data were abstracted on anesthesia, monitoring, fluid management, intra-experimental drug administration, and euthanasia. Models of ARDS and mechanical ventilation. Details were extracted on the means of inducing experimental ARDS and on the definition of ARDS applied in each study. Additional data were extracted to assess mechanical ventilation practices before and during ECMO. Models of ECMO and its intra-experimental management. Data were recorded on the mode of ECMO employed, devices used, the method and configuration of cannulation, priming, flow rates, pump speeds, sweep gas settings, anticoagulation practices, and the duration of extracorporeal support. Studies published after 2011 were assessed for compliance with the Animal Research: Reporting of In Vivo Experiments (ARRIVE) guidelines . Data were tabulated for ease of comparison. Summary statistics were used as appropriate. Given the heterogeneous nature of included studies and the aim of this review, to characterize and assess the quality of the models rather than the study outcomes, no attempt was made at meta-analysis. A total of 370 unique citations were identified in our search. Of these, 44 passed the first phase of screening and had full-text articles retrieved. After secondary screening, 17 articles met the inclusion criteria and were included in the final analysis [12–28]. Figure 1 shows the PRISMA flow diagram for study inclusion and exclusion. An overview of included studies is included in Table 1. More than two thirds (n = 12) were published after 2009. Most studies were conducted in Europe (n = 5) and Asia (n = 5), followed by North America (n = 4), South America (n = 2), and Australasia (n = 1). The purpose of studies varied but included physiological studies (n = 6), technology evaluations (n = 5), and interventional trials (n = 5). All studies were conducted in large animals, the majority in pigs (n = 10), followed by sheep (n = 6) and a single canine study. No small animal models met the inclusion criteria. The median number of animals studied was 17 (12–24), with the largest two studies using 30 animals. The median duration of included studies was 8 (5–24) hours, with two studies, both in pigs, reporting recovery and follow-up of 7 and 14 days, respectively . A summary of the peri-experimental care of animals is provided in Table 2. More than half (n = 9) of studies used exclusively female animals, while five did not report gender. The age of the animals was inconsistently documented, with 10 studies omitting this detail. The majority of investigators used total intravenous anesthesia (n = 14), including the two studies that involved recovery from anesthesia [26, 28]. Ketamine was the most commonly used anesthetic, with a maintenance dose range between 5 and 10 mg/kg/h. Inhalational anesthesia was used in two studies [16, 19]. Only four studies reported a protocolized approach to cardiovascular support [12, 24, 25, 27], while six studies provided data on cumulative fluid balance. A summary of the means of inducing experimental ARDS in studies is contained in Table 1. A range of ARDS models are described, including oleic acid (OA) infusion (n = 4), lipopolysaccharide (LPS) infusion (n = 3), saline lavage (n = 3), hypoxia (n = 2), blunt injury (n = 1), and smoke inhalation (n = 1). Three further studies combined saline lavage with a secondary injury. Definitions of experimental ARDS were varied and not universally reported (Table 3). Likewise, mechanical ventilatory practices, both before and during ECMO, were incompletely described (Table 4). Most studies performed veno-venous ECMO (n = 13). A summary of ECMO models and the management of ECMO during experiments are provided in Table 5. In most cases (n = 14), cannulation was peripheral, with three studies performing surgical cutdown [17, 25, 28]. There were a wide variety of cannulation configurations among studies. Few studies described a means of confirming cannula positioning, although peripheral ultrasonography [17, 24], intracardiac sonography , and a pressure guided method [22, 29] were reported. A range of commercial and experimental pumps and oxygenators were used. The constituents of priming solutions were described in less than half of the studies (n = 8) but included saline [12, 13, 24], lactated Ringers (LR) , albumin and saline , hydroxyethyl starch (HES) and LR , Voluven and LR , and Plasmalyte-148 and albumin . The use of heparin as an anticoagulant was ubiquitous. No study published after 2011 explicitly referenced the ARRIVE standards or reported compliance with them. This systematic review provides the first detailed overview of animal models which combine features of experimental ARDS with ECMO. In doing so, we have demonstrated marked heterogeneity in both their design and reporting. Animal models play a key role in research into ARDS and are well established in both small  and large animal species . Given the complexity of the underlying pathophysiology, they are essential tools for deriving new mechanistic insights as well as establishing the efficacy and safety of novel interventions . Their place in current ECMO research is less clear. Our study found no example of a contemporary small animal model combining features of ARDS and ECMO. This may reflect the inherent difficulties of replicating a clinically relevant extracorporeal circulation in a small animal species, although such models have been described in the absence of lung injury in rodents  and rabbits [34, 35]. While small animal models are limited by the inability to use clinical ECMO devices, differences in lung morphology , and variations in innate immunity , they offer several advantages. Studies involving small animal species are less resource intensive than those in large animals, can be conducted more quickly, may take advantage of varied genetic strains, and have the advantage of using multiple assays and imaging techniques not available in large animals. All models identified by our study were conducted in large animals. These models may have advantages, which are generally the converse of the limitations seen in small animals. A feature of studies in our review is their relatively short duration, with only two models describing recovery and follow-up beyond 24 h . This may be a result of the intensive and costly nature of large animal studies, although models supported for more than 24 h and/or those with the potential for recovery would be of benefit in addressing important research questions. In the context of ARDS and ECMO, models of greater duration would facilitate research into the proliferative phase of lung injury, allow investigators to explore lung recovery during ECMO, and could test approaches to weaning from extracorporeal support. Regardless of species, models of experimental ARDS identified in this study were diverse. Previously, the American Thoracic Society (ATS) has attempted to standardize experimental ARDS by identifying core pathophysiological features which should be established in pre-clinical models . In our review, few studies published after the ATS workshop report acknowledge these features or reported compliance. To increase the validity of studies, the presence or absence of these features should be evaluated during model development. Most commonly described means of inducing lung injury were described: saline lavage, oleic acid infusion, endotoxemia, acid aspiration, and smoke inhalation. Notably, we failed to identify a study which included the use of live bacteria, a method frequently employed in singular models of experimental ARDS . Recent work, using latent class analysis (LCA), has identified stable ARDS phenotypes present in large clinical trial cohorts. These have been broadly represented as ‘hyper-’ or ‘hypo-inflammatory’, each group having distinct clinical and biological features. Importantly, sub-phenotypes also appear to have differing responses to treatment and variations in outcome [39–41]. This work has implications for the design of pre-clinical studies. In our review, there is a preponderance toward models which likely induce ‘hypo-inflammatory’ ARDS, such as oleic acid infusion and saline lavage, both have which have been associated with a failure to induce pro-inflammatory cytokines or significant neutrophil influx to the lung . In future, investigators should consider phenotypes when contemplating a method of injury. Regardless of the method of achieving experimental ARDS in animals, models that incorporate ECMO must also take account of the severity of the disease. Only four studies identified by our review targeted an injury which delivered a partial pressure of oxygen to inspired fraction of oxygen (P/F) ratio of less than 100 mmHg [13, 20, 24, 25]. No included study evaluated ventilatory pressures or the presence of acidosis as part of the definition of injury. Future models, particularly those used to assess interventions during ECMO, should aim to replicate clinically meaningful injury criteria such as those used for inclusion into large clinical trials . The supportive care administered to animals in included studies was an area of significant variation. The choice of agent for the induction and maintenance of anesthesia differed between studies, although almost all employed a total intravenous approach. The influence of anesthesia on outcomes of interest should be considered during the design of a model, and this is particularly true in respect of inhalational agents where emerging evidence points toward a potential role in modifying the inflammatory response associated with ARDS . Reassuringly, most models described combining anesthetic and analgesic infusions, commonly with the addition of fentanyl. Only four models reported the use of neuromuscular blockade [12, 17, 24, 27]. Ten of the models were reported after publication of the ACURASYS study, which reported an improvement in mortality among patients with severe ARDS receiving early paralysis . While some models may seek to evaluate spontaneous breathing during ECMO, neuromuscular blockade should be considered a standard of care in severe ARDS and thus be replicated as a feature of a high fidelity pre-clinical model. Mechanical ventilation practices, both before and after the institution of ECMO, were poorly described. Few studies instituted lung-protective ventilation prior to ECMO and many described using tidal volumes in excess of 8 mL/kg. Given the clear evidence for low tidal volume ventilation in ARDS , failure to implement this in pre-clinical models limits their validity. While the evidence supporting approaches to ventilation during ECMO is less well defined, only one model reported the use of an ultra-protective ventilatory strategy . Levels of positive end-expiratory pressure (PEEP) during ECMO also appear low when compared with contemporary clinical practice . Considering the importance of mechanical ventilation in ARDS and its ability to aggravate injury through ventilator-induced lung injury (VILI), models of ARDS and ECMO should at a minimum provide a detailed description of ventilatory practices. In general, reporting of ECMO was more complete. All models provided a description of cannula configuration. In the future, investigators should use the Extracorporeal Life Support Organization Maastricht Treaty on ECMO nomenclature to ensure consistency and clarity . As would be expected, models employed a variety of ECMO devices, many of which are in contemporary clinical use. While flow and sweep gas settings were well reported, few studies provided details on gas exchange targets during ECMO, with only 1 in 4 stating a target PaO2 and less than half providing a target PaCO2. Heparin was the anticoagulant of choice in every model that provided details of anticoagulation practice. Likewise, all but three studies provided target activated clotting time (ACT) ranges. The ubiquity of ACT may reflect the relatively short duration of included models and the requirement for a cost-effective bedside measure of coagulation. Anticoagulation targets varied between models, which may reflect continuing uncertainty as to the optimal clinical regime . No study identified by this review, and published after 2011, explicitly referenced the ARRIVE guidelines for improving the reporting of animal studies . This is perhaps not a feature limited to models of ARDS and ECMO, but instead reflects a wider issue with adherence despite widespread support for the standard . While adherence to the ARRIVE standards (or similar) is likely to enhance the quality and reproducibility of published studies, there are many subject-specific domains (e.g., technical aspects of ECMO, mechanical ventilation practices) which are equally important but omitted by these higher-level guidelines. Several initiatives have attempted to address this in pre-clinical stroke models and more recently in sepsis. Here we have outlined what domains a minimum reporting standard for pre-clinical models of ARDS and ECMO may contain (Table 6). Our review has several limitations. Firstly, despite each included study being the first description of a combined model of ARDS and ECMO, occasionally investigators used components of previous instances of experimental ARDS or ECMO in creating them. Where such studies were referenced, we made every attempt to retrieve relevant data. Secondly, no formal risk of bias assessment was undertaken as part of this review. While this limited our ability to assess the quality of included studies, the principal aim of our review was to identify and describe models. Finally, an arbitrary date was used to exclude historical models of ARDS and ECMO. This was pre-judged to allow consideration of models most likely to have contemporary clinical significance but may have excluded older models which remain viable. A limited number of models combine the features of experimental ARDS with ECMO. Among those that exist, there is significant heterogeneity in both design and reporting. This creates difficulty in assessing results and in generalizing findings to clinical settings. There is a need to standardize the reporting of pre-clinical studies using in this area. This could be achieved by the introduction of a minimum data set for pre-clinical ECMO studies. JEM is supported by the National Health and Medical Research Council (NHMRC), Australia (APP1079421). JEM conceived and designed the systematic review. JEM, NB, and VvB conducted data screening and extraction. All authors participated in the drafting and critical revision of the manuscript. All authors read and approved the final manuscript.